Art is often said to have healing powers, and beginning tomorrow many people who live in the path of Hurricane Sandy — which struck a month ago — will have a chance to see a piece of art created for them. It’s a “monumental” laser installation by Yvette Mattern called Global Rainbow, After the Storm, launched from the rooftop of the Standard Hotel at the Highline. 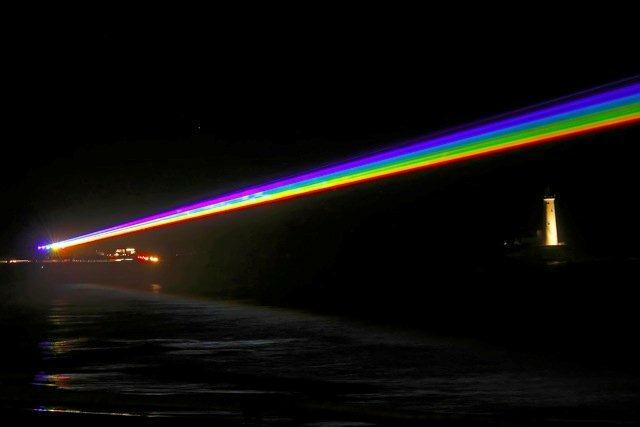 Designed to illuminate the night sky and be visible for up to 35 miles (depending on atmospheric conditions), the work will aim seven beams of high power light lasers over communities hit by Sandy. It “aims to symbolize hope and act as a call to action to support the communities that were devastated by the storm,” according to the press release. Mattern’s installation, which has been presented in Europe (you may have seen it at the London Olympics), will shine for three nights, from 8 p.m. to 2 a.m. nightly, from Nov. 27 through Nov. 29. That’s asking a lot of art, but … at times like these, it’s nice to remember that art can have a higher purpose and a universal appeal.